The new helmet rules continue to be applied as written. Which will continue to make football something other than football. 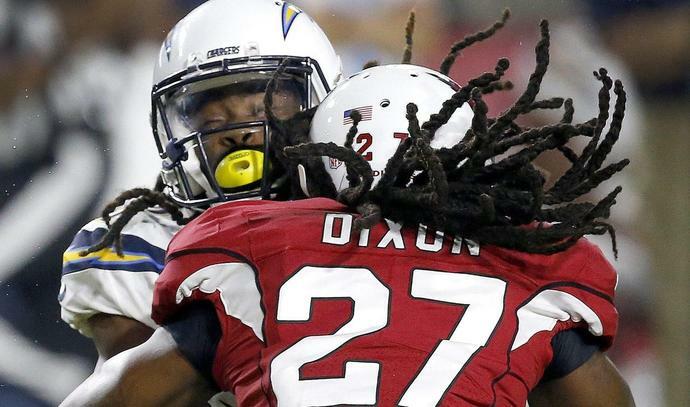 In Saturday night's game between the Chargers and Cardinals, a pair of fouls were called on Arizona players. One, a penalty called on safety A.J. Howard, wiped out a fumble that the Cardinals had recovered. It was called an illegal hit on a defenseless receiver, but Chargers tight end Sean Culkin surely had the ball long enough to no longer be defenseless (indeed, he had the ball long enough to complete the process of making the catch). The far more likely reality is that Howard was flagged for lowering his helmet to initiate contact, which is precisely what he did. But here's the problem: What else could he have done? Watch the video; Howard tries to execute a form tackle in real time and at full speed. But he misses the mark and his helmet hits Culkin. As the rule is written, it should be a penalty every time. It happened again, in the same game. Cardinals safety Travell Dixon, while apparently attempting to execute a form tackle, lowered his helmet and made contact with Chargers receiver Geremy Davis. The flag was thrown. Again, as the rule is written, it's a foul. Yes, referee Brad Allen has said that more of these fouls will be called during the preseason. But the rule says what it says, and the rule is being applied properly. The problem is that the non-football players who crafted the 21-word rule made it so broad that it will attempt to correct behavior that is, as a practical matter, uncorrectable within the confines of the way the game has been played, for decades. Coaches should be concerned. Owners should be concerned. Executives should be concerned. The Commissioner should be concerned. Someone hijacked the game in March by downplaying to the membership what this rule would do to the game, comparing it to the rule that prohibits the ramming of the top of the helmet into an opponent outside the tackle box. Players quickly stopped using that technique, because it was a specific, defined maneuver that was easily spotted, easily called, and easily abandoned. This new rule is far broader, encompassing not only the intentional use of the helmet as a weapon but all inadvertent contact that occurs when one player who is moving collides with another player who is moving. And the smart thing to do would be to re-write the rule in a more narrow and precise way, to convene an emergency meeting of the owners (by phone if need be), and to ram through the revised rule the same way the first version of the rule was rammed through the league meetings in March. So get ready for a season that will quite possibly carry an asterisk for all the wrong reasons. It quite possibly will be the season in which ambiguity, happenstance, and random discretion ultimately have a significant role in who makes it to the playoffs and, ultimately, who wins the Super Bowl.